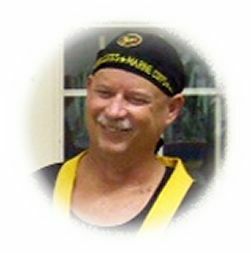 Hanshi Vance Steele was born March 3,1956 in Pueblo CO. Hanshi enjoyed a very happy childhood, with plenty of good memories of times spent with his family. However by the age of 11 the realities of a harsh world began to creep in and Hanshi found himself on numerous occasions pursued by neighborhood bullies. Several altercations would occur between the ages of 11 and 15 where Hanshi and his brother Vince would have to defend themselves, sometimes far outnumbered in their forces. Because of these problems through grade school and middle school, being pushed into the bathrooms and beaten on by 6 or 7 guys at a time he learned young what it was to hate. At the age of 15 Hanshi Vance began his martial arts training at the local YMCA in Pueblo. Over the next four years through high school he would train under his Sensei, Anthony Sandoval, and Mr. Bill Stuart. This training would be a profound inspiration to Hanshi Steele for the rest of his life. At the time Hanshi started training with his instructors they had not yet changed into Butokukan, but were still teaching Shinpu-Ren. Hanshi was trained primarily in Shinpu-Ren until this change took place with his instructors in Colorado. During his training many aspects of other arts were explored and practiced, including judo, flying kicks, and ground fighting, thus making the students phenomenal kickers and fighters. A great deal of time was spent in independent study. At the point of being promoted to black belt Hanshi Steele and several of the other students of Mr. Sandoval went to Bremerton WA to prove their value as black belts. They had the privilege of training with Master Robert Hill and in fact even worked on the roof of his home. Showing their ability to be humble and serve was equal to proving their prowess on the floor. Shortly after being promoted to black belt, Hanshi Steele and his brother Vince opened their own dojo. In time Hanshi Steele and his instructor Mr. Sandoval parted ways.Hanshi Steele spent countless hours training and refining the Shinpu-Ren system back into the powerful and versatile style that it had once been and would once again become. Other Masters such as Master Steven Fisher of Shotokan and Shorin ryu and Master Art Sapp of Tae Kwan Do, were invited in to the Steele dojo to bring new knowledge and techniques to the students. Over the next twenty years of teaching and training Hanshi Steele had the privilege of training and competing with many of the great legends of the martial arts world. "Those were good times back then, great teachers would come together with no animosity, for the sole purpose of sharing ideas and techniques, everyone worked together and every one grew so much from the interaction". In his college years around 1981, Hanshi Steele moved to Oregon to teach and train while attending school. Also at this time Hanshi Steele founded his Christian Martial Arts Association. This aspect of his martial arts career continues through to this day, as he is a devout Christian who uses his martial arts knowledge as he says ,"to glorify the lord". During his time in Oregon his students had a powerful demo team, and with this team and their ministry and the martial arts, they were able to bring Christianity to over 450 troubled youth that society had given up on. His estimate is that of a 95% success rate with these youth to turn their lives around. This association has since changed crest and name, and is now Warriors for the Lord. He spends a great deal of time with his street ministry, working with many of societies throw away's. During this time Hanshi Steele also trained in Tai Chi Chaun Kung Fu, he trained under the brother of Dr.Yen the Master of the small circle Ju Jitsu Foundation. He trained in Muay Thai Boxing and trained with Master Tim Allen in Wing Chung Kung Fu. Hanshi Steele received some formal weapons training from Master Tadashi Yamashita and Master Fumio Demura. From 1971 until 1998 Hanshi Steele competed frequently in full contact, light contact, point contact, no contact, bare knuckles, bare feet, the whole transition of martial arts competition from the 1970's until present day. He had the privilege of competing against such people as Benny (The Jet) Urquidez, Chip Wright, students of Mr. Bill Wallace, students of Tadashi Yamashita, Al DeCostos and his students. Hanshi Steele speaks very fondly of the warrior spirit from those times, the incredible talent of the many martial artists that would come together and demonstrate that spirit time and again in the ring. During his time in Oregon he also was accepted as a trainer for the Department of Corrections officers. This training included but was not limited to self defense, cuffing, baton, tazers, mace, CPR, and inmate staff relations. Shortly thereafter he became an instructor for the Oregon Police Academy and a member of T.E.R.T (tactical emergency response team) and a member of the Oregon S.W.A.T to help keep peace in the prisons. He was one of 6 members of the Police Olympic Team. He has spent time providing additional training to Marines in knife fighting and stealth techniques for kill training. In 1998 Hanshi Steele retired from competition and took a much needed sabbatical. Dr.'s told him that it was time to retire after 750 full contact fights, numerous street fights, and prison altercations and years of hard style training he was suffering from brain damage caused by all of the impact over the years, and to not retire would be crippling. This was a very difficult time in Hanshi Steele's life. Toward the end of his long sabbatical one of his students John Kraemer found him at a little church in Detroit Oregon. John reminded him of the brotherhood that they shared through the martial arts, and let Hanshi know that there were still many people who cared about him and needed him. This act helped Hanshi to get back on his feet and to again actively participate and support the Shinpu-Ren system that he had re-instituted many years before. Hanshi Steele now leads a very active life and spends a great deal of his time participating in bicycling races for benefit causes such as children's hospital, the cancer foundation, diabetes etc. He provides unique and steadfast support of the Shinpu-Ren schools under him. Visiting and bringing his knowledge and presence to the schools every chance he has. The benefit received of the schools by having him actively participating and guiding them is immense. All of the instructors under him hold him in the highest regard and are grateful for his service to them and the martial arts. Hanshi has said," God put me here to be a servant to all, to defend the weak and the weary. I believe once a warrior always a warrior you cannot turn your back on what you are. Warriors were put here on earth to be just that, to protect those who cannot protect themselves and to serve. Accept what you are. My students bless me with their dedication and respect and I can only hope they will take that warrior spirit into the world with them and use it in service to the lord'. Sign-Up for classes! Have questions? Need more information? Speak to an instructor? Shinpu-Ren Family Karate is a local martial arts dojo conveniently located to serve the communities of Prescott, Prescott Valley, Chino Valley, Dewey, Humbolt, Arizona.